Chocolate Frosted Éclairs with Fluffy Vanilla Pastry Cream and Fresh Strawberries + 5 Éclair Recipes You Should Try! Everyone has a comfort zone. Is that a bad thing? I don’t think so, but comfort zones get a bad rap. “Experts” think if one stays in their comfort zone for too long one might become overwhelmingly bored and fearful. Wiki How has a 4 step process, with drawings, to help you get out of this scary place. Where would we be without Wiki How? I think comfort zones serve a purpose, a good purpose. They provide respite, and who doesn’t need a little of that once in a while? In many ways I am living outside of my safe place. I feel myself stretching as a mother and wife. I see myself figuring out what’s next when my small people need me less. Yet, during this time of change and growth, I ache for a place of ease and rest. Is the grass always greener on the other side? If I found myself in a place of comfort, would I then need to shake things up a bit? Probably. I think it is my nature. This week I channeled my energy and baked something new. 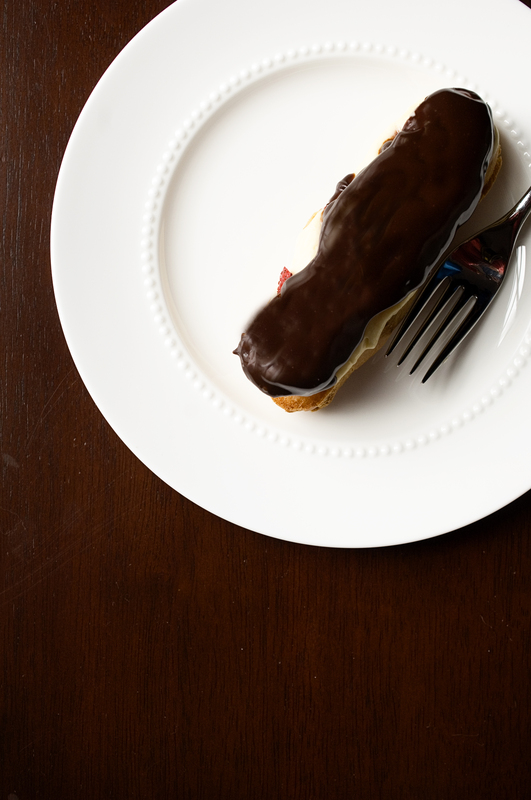 I accepted Love and Olive Oil’s April food challenge and made éclairs. I find éclairs intimidating. Its made up three separate components all of which I could screw up at any moment. Also, it’s considered a pastry. Yikes! I can make cookies, brownies and blondies. Cakes? Sure. Cupcakes? Yup. Pastries? Ugh, I’m scared. Is it the pate a choux, a.k.a., the light pastry dough? 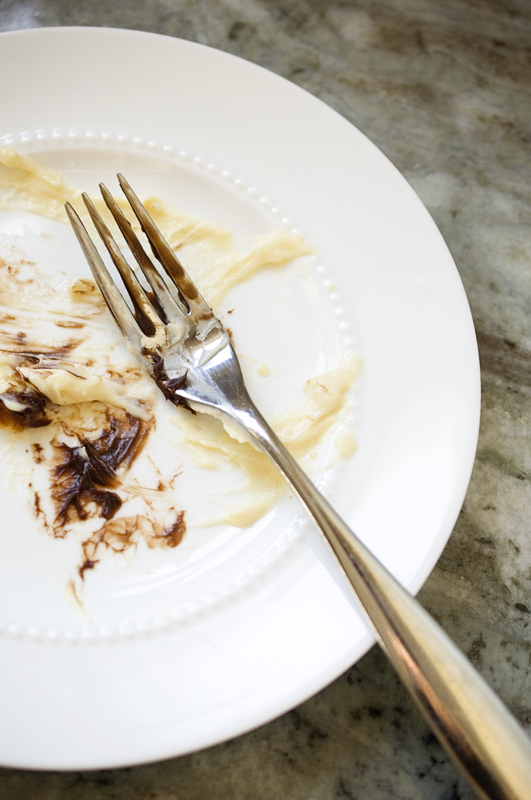 Maybe it’s the pastry cream or the chocolate ganache? It seemed like too much for me, until I came across Joanne Chang’s recipe. I love her cookbook, Flour. I tried several of her recipes since I first bought the book and they were fantastic. Why not try her éclairs? So I did! The task was easier than I anticipated and they tasted great. The pate a choux is airy and buttery. The vanilla cream is lightened with whip cream making it fluffy, not thick like a custard. Chang calls it a Tropez cream because it is often a filling for a French pastry called St. Tropez: a brioche roll is soaked in a sugar syrup and filled with this vanilla cream. Yum! Oh and the ganache? Super easy to make and tastes so, so good! Use good quality chocolate because you will taste the difference. Add some fresh fruit like strawberries and you have a perfect dessert. Make these éclairs for Easter or Passover this month and watch your family go nuts for them! Pre-heat your oven to 400. Line two baking sheets with parchment paper and set aside. In a medium saucepan, heat the butter, sugar, salt and water over medium heat until the butter melts. Do not let the mixture come to a boil. Add the flour and stir into the liquid until it is fully incorporated. The mixture will look stiff. Keep stirring over medium heat until it looks more like loose dough. Stir constantly for about 4 minutes. Remove from the heat and transfer the dough to a stand mixer fitted with a paddle attachment. Mix the dough on low-speed for about a minute to allow some of the steam to escape. Meanwhile, whisk the 4 eggs in a separate bowl. Increase the speed to medium-low and gradually add the eggs to the dough. Turn the speed up a bit more and beat for about 20 seconds. The dough should be glossy. Place the dough in a pastry bag fitted with a 1-inch round tip. Pipe, twelve, 5-inch-long logs onto a baking sheet about an inch apart and bake for 15 minutes. Turn the oven down to 325 and bake for another 30 minutes or until golden brown. Allow to cool completely on pan on a wire rack. Do not fill them until they are completely cool! At this point the unfilled pastry shells can be stored in an air tight container in the freezer for 2 weeks. They can also be stored in an air tight container, at room temperature for 2 days. In a small bowl, stir together the cake flour, sugar and salt. In a separate, medium bowl whisk together the egg and egg yolk. Slowly whisk the flour/sugar mixture into the eggs. The mixture will be thick. Remove the milk from the heat and slowly add it to the sugar/flour mixture, whisking constantly. When the milk is fully incorporated return the mixture to the sauce pan. Over medium heat, whisk constantly and quickly for about 5 to 6 minutes or until the mixture thickens and comes to a boil. Remove the pan from the heat. Pour the cream into heat proof bowl. Stir in the vanilla extract. Cover with plastic wrap by placing it directly on the surface of the custard so a skin doesn’t form. Refrigerate until cold, at least 4 hours and up to 3 days. When you are ready to fill the éclairs, beat the heavy cream with a hand-held mixer until it is thick and holds a soft peak. Fold the cream into custard until completely combined. Refrigerate until ready to use. Place your chopped chocolate or chocolate chips in a heat proof bowl and set aside. In a small sauce pan over medium-high heat, scald the cream. (Bubbles should form at the edge of the pan but not boil.) Pour the hot cream over the chocolate and allow it to sit for about 30 seconds. Slowly whisk the chocolate and cream together until the chocolate melts and is smooth. Cool to room temperature. The ganache can be store in air tight container, in the refrigerator for up to 1 week. Bring to room temperature before using. Using a serrated knife, split the éclairs in half and fill the bottom half with vanilla pastry cream and sliced fresh strawberries. Dip the top half, upside down into the chocolate ganache. Place the top on the other half. If you can wait, allow them to sit for a few minutes so the chocolate can set. I couldn’t wait. Enjoy within a few hours! 5 Éclair Recipes You Should Try! 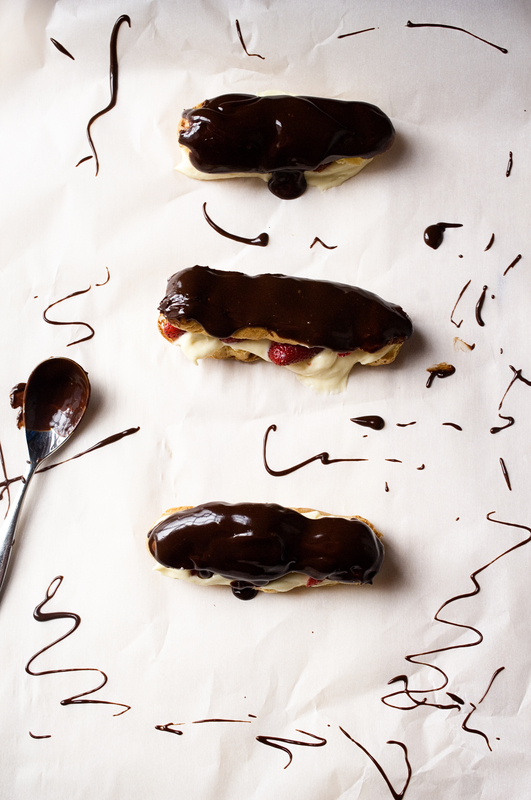 I heart these pretty raspberry eclairs from Spoon Fork Bacon. This is a perfect dessert for mother’s day or a shower! 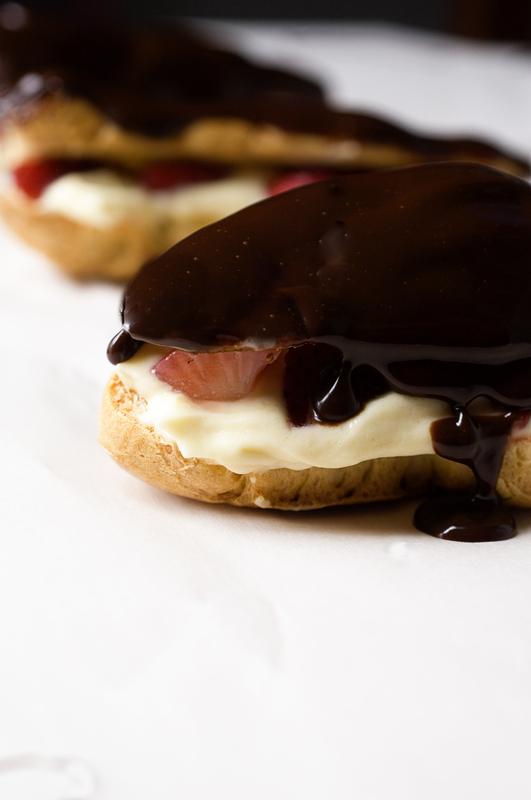 As a kid I loved banana split sundaes, and I liked éclairs, but I never had a banana split éclair. No, really, it exists. Bakers Royal has the recipe and the photos make my mouth water! If you like caramel you should Trissalicious recipe for salted caramel éclairs. They look incredible! Chocolate lover? Tartelette blog has a recipe for chocolate éclairs. Just chocolate éclairs? No! Éclairs filled with chocolate pastry cream and topped with chocolate glaze and Indian praline. This recipe hails from one of the best pastry chefs in the world: Pierre Hermé. Looking to make a dessert for two? Try mini éclairs! Dessert for Two has the recipe and be sure to check out the rest of her fantastic recipes… just for two.